These seven housing solutions prototypes share a series of characteristics. First of all, the structure of the “house” is either simple, made of a single unit (2,4 m wide), or complex, built from 2 units (4,8 m wide). They are equipped with ventilation, sewage, water, climateric adaptation and electricity systems of ducts and pipes that come in a service shaft, positioned in the middle of the unit, near the bathroom. Along with this package, there is also an assemblage of overall internal insulation of thermal, cold, phonic and fire-resistant type. Another feature would be that each model has large windows, which ensures sufficient light exposure and range of sight. The presence of heavy steel frames within these units allows storage to a great extent. And above all, they are CSC plated (Container Safety Convention), which means that they meet all the requirements and standards for a container vessel. Tempohousing provides prefabricated products that come in an ISO universal assembly of 2,4 m wide units. The standardised size confers the privilege of reusing the units. Apart from this, the fixed-sized units can be combined (2, 3 or more units altogether) to build a range of structures of various dimensions. The first model uses a 1 x 40' x 8'6'' container, structured in three compartments. The bathroom is in the middle, having doors on both sides, which allows the acces in the two adjiacent rooms. These have 12 square metres each and a separate entry. The Director model is based on a 2 x 40' x 9'6'' container with connecting sections at either end. In this case, the rooms are larger than 3 metres, thus offering a solution for permanent housing. For the third model, the Manager prototype, a 1 x 40' x 8'6'' container with separation wall in the middle is employed. Similar to the Bachelor model, this one has two discrete entries too, but 2 bathrooms. Optionally, one could build a second kitchen. 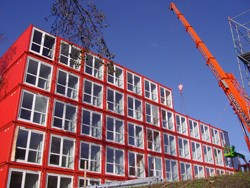 The Master model, (an example in erecting labour hotels) relies on a container with the dimensions 2 x 40' x 8'6'', having a connecting door in the middle. 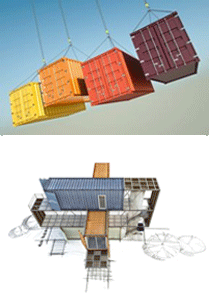 The containers is structured in 4 rooms with a 12-15 square metres. Further more, the Professor model is designed as a one-person household, using a 1 x 40' x 8'6'' container. As far as the internal witdth and height are concerned, the dimension is 2,25 metres. This model was employed in the projects of student housing in Diemen and those of the Salvation Army. Last but not least, the Starter model engages a container with the folllowing parameters: 1 x 40' x 8'6''. The container is made of 2 apartments of 10 square metres each (with its own entrance) separated by a central hallway. The household is equipped with 2 bathrooms and 2 kitchens. One can opt for any of these housing solutions according to their needs as the units can be arranged and set out in various ways.